The Capitolium Hotel is located in a historical building of the late 19th century, conveniently situated in a central area, close to the Embassies of Great Britain, Russia and Turkey; just a few steps from the historical site "Porta Pia". From the Hotel Capitolium you can easily reach the center and other areas of the city thanks to the vicinity of the Metro and buses stops. Hotel Capitolium is an island of calm for your roman stay, with the warmth and the comfort of your home. Facing a wonderful garden, you will not be disturbed by the noise of the traffic, though you are in the center. All rooms have private bathroom with hairdryer, lcd tv, frigobar, safe box, high speed internet connection, thermos with choice of several hot drinks. Some rooms have the bathroom equipped with a Jacuzzi jet shower. A double bed room with a living is also available for those who prefer a better comfort. For a pleasant stay in the city, we can organize excursions, book a private car with driver, reserve your transfert from and to the Airport. 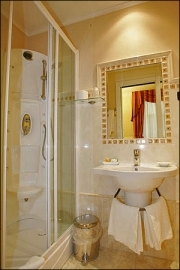 All rooms with bath or shower, direct dial telephone, satellite TV, double glazing, Air conditioning, service of breakfast.